Above mentioned Bible verses are interrelated. 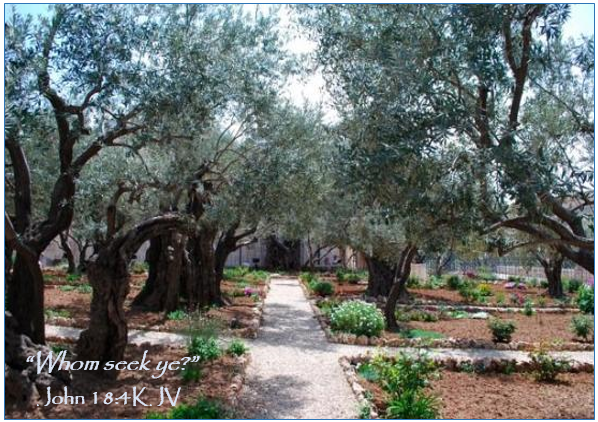 The question Jesus asked “Whom seek ye?” in the Garden of Olives is a follow up of the question God asked “Where art thou?” in the Garden of Eden. As soon as Adam and Eve had eaten the fruit of the tree of good and evil absolutely forbidden by God their eyes were opened. They felt guilt and fear and they made themselves breeches of fig leaves for they were ashamed. When the LORD called out to Adam “Where art thou?” Adam tried to hide himself for His Creator. Sin and death came into this world by the first Adam. God’s own, the man turned against Him by disobeying Him and therefore man was now under control of satan. Adam in the wonderful Garden of Eden was not able to resist the devil and believed satan’s lies. Lord Jesus without food in the wilderness forty days and forty nights did resist the devil, the father of lies and He said: in Matthew 4:10 “Get thee hence satan” (=go away from me satan). The devil tried to tempt Christ three times The Saviour did not fall. The Second Adam, Christ completely fulfilled and finished with His precious Blood the Law of the Father on the cursed tree of Golgotha, destroying satan’s work, like satan once destroyed God’s Work in the Garden of Eden. God obtained His own that once belonged to Him. Although satan’s work is totally destroyed it seems that mankind does not know what it means, this wonderful Blessedness and Salvation through grace. Science, politics non-governmental organizations and multi-nationals are still enjoying the fruit of the tree of good and evil. That means manipulating God’s Truth and leaving out the very essentials. Still holding on to the evolution theory, which brought forth gruesome outgrows of , catholicism, new age and any other old eastern religion based upon works and traditions. The tree of good and evil cannot make fruit; it is a tree of death and destruction. The Tree of Life is the Fruit. Christ the Saviour is meant with the Tree of Life; He is the Life and He can restore life. “Where art thou?” a question that makes us shiver. It means separated from the LORD and condemnation of death.